VendReDi 23 fEvRIEr It’s WeEk End !!!! On FiNi àÀaÀaÀaÀaÀ 3H !!!!!! Yes, it defies the friends !!! 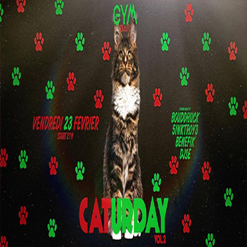 It’s the « Caturday » DJ Bouddhuck, 5inktroy3, DJ Benefik & DJSE Aux PlAtInEs !!! And BaHHH çA vAs EnVoYeR LoUrd, cHaUd TeCHno !!! Put your cat’s ear, your little Mustache and let’s go on the DanCEflOoR !!!! CocKTail & GrOs his prOGraMme, it’s caTuRdAy!